JUPITER, Fla. — When we first moved to Colorado, we lived for a stretch at the Hotel Boulderado and Pearl Street Mall was my backyard. The hotel and my tiny room may or may not have been referenced in Stephen King’s book Misery — as a kid I swear it was; as an adult I doubt it — and it had the wonderful grand, historic feel with that little twinge of unsettling gothic-ness. We’d breakfast at the restaurant on the first floor. We’d stroll Pearl Street in the afternoon. I learned how to leapfrog on these metal pylons that were designed to keep cars from barreling into the pedestrian mall. And we made a second home of the nearby used bookstore. It wasn’t too far from The Daily Camera, right down by the top shoppe Grand Rabbits, and just past the place we’d later go to get my violin repaired — several times. This bookshop, Boulder Used Books (I think), had the classic smell and look of its name. The main room was a jumble of misfit shelves, drooping with the weight of paperbacks stuffed at various angles. The place reeked of old paper, ink, dust and that slightly vinegary mix of all three that can only can described as wisdom. It’s the same smell I Iater found at a university’s library in Oxford, one that outdated, oh, America. And picking through this island of misfit books and dog-eared novels one day I found a treasure that inspired. And it wasn’t a book. 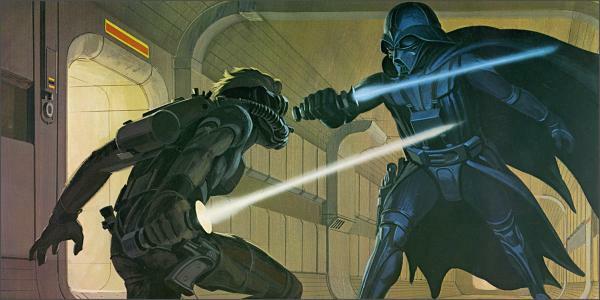 Gas-masked "Hero Starkiller," the character who would become Luke Skywalker, faces Darth Vader in an early concept drawing by artist Ralph McQuarrie. There was so much right and yet so much confusing about this picture. I was said to be a concept rendering for “Star Wars IV: A New Hope,” and yet there was Luke — who wasn’t Luke — dueling (the boy wonder calls it, “swording”) Darth Vader in a fight that didn’t happen in that movie. There’s a gas mask. There’s sharp angular look to Vader’s mask. There’s a pistol right there on Vader’s hip. A pistol! This was the most dynamic and fascinating picture I’d seen, and inside this portfolio there were more than a dozen like it. There was a drawing of C-3PO as a bronze and feminine droid. There was Chewbacca looking somewhat like a mix between a werewolf and vampire. There was Han dressed as some sort of spice trader from Venice. And there was a picture of a Stormtrooper holding a lightsaber. A lightsaber! A Stormtripper confronting our merry band of heroes in apparently the LAX concourse with a lightsaber. A frickin' lightsaber! I bought the portfolio, of course. It wiped out my savings from a few weeks and it meant no baseball cards for a good stretch. But these drawings were magical. They were like a window into an alternate reality “Star Wars” — where Wookies were descended from Nosferatu and everyone carried a lightsaber — and they showed me what else was possible with art. I spread these prints around the floor of my hotel room, and I would try to recreate the energetic sweeps of the pen and paint that I saw. If there is one picture that steered me toward the dynamic poses of comic-book heroes and that cinematography-style of 2-D drawings it’s that one that shows Starkiller vs. Vader. It’s a picture that I don’t need to see to remember all of the details because as kid I lived with that picture, I aimed for that picture, I wanted to draw a picture just like that. 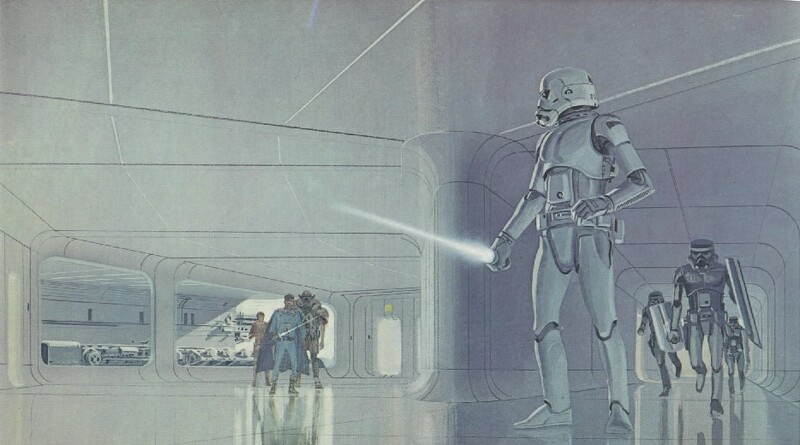 The artist behind that picture was Ralph McQuarrie. He was one of the first people George Lucas hired when he started making his space epic, and it was McQuarrie who was the star behind “Star Wars,” the vision behind Vader. McQuarrie died Saturday. He was 82. Through all my moves, I’ve kept that portfolio close, and always with a prominent or handy spot on my bookshelf. It went with me to college. It was one of the first things I placed in the milk-crate bookshelves I fashioned in Slidell, La., at first my apartment. And it was there when the boy wonder took an interest in “Star Wars.” We’ve looked through it many, many times. He knows it well enough that when we went to Toys R’ Us a year or so ago, he was the first to spot the box of action figures inspired by the McQuarrie concepts. My son knows that an action figure of the artist himself — one featuring him as the character he played in one of the movies, in the background — is up on the wall of my office. There are other comic book artists who have inspired or influenced me — or outright intimidated me into becoming a writer — and I have prints and covers and sketches from there around too. But while I can spot an Arthur Adams with one glance, have studiously scanned John Romita Jr.’s work on any Spider-Man title to decode his talent, and have almost every issue drawn by Todd MacFarlane, I don’t recall where I first was when I saw their art. I won’t ever forget every detail of the day I found McQuarrie’s. This entry was posted in books, boy wonder, comics, journal, project 365+ and tagged comic books, hotel boulderado, ralph mcquarrie, star wars by dgoold. Bookmark the permalink.